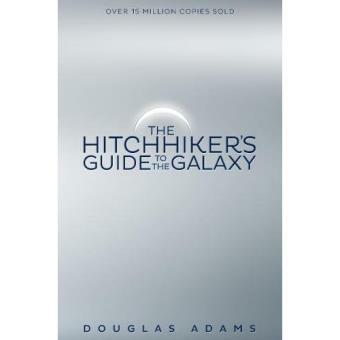 The intergalactic adventures of Arthur Dent begin in the first volume of the 'trilogy of five', Douglas Adams' comedy sci-fi classic "The Hitchhiker's Guide to the Galaxy". On 12 October 1979 the most remarkable book ever to come out of the great publishing corporations of Ursa Minor (and Earth) was made available to humanity - "The Hitchhiker's Guide to the Galaxy". It's an ordinary Thursday lunchtime for Arthur Dent until his house gets demolished. The Earth follows shortly afterwards to make way for a new hyperspace express route, and his best friend has just announced that he's an alien. At this moment, they're hurtling through space with nothing but their towels and an innocuous-looking book inscribed, in large friendly letters, with the words: DON'T PANIC.